At the June Summit, which will take place after the UK Referendum, the High Representative of the Union for Foreign Affairs and Security Policy, Federica Mogherini, will present the results of her global review of external strategy. As part of the review process, the Human Security Study Group, at the LSE, which is convened by Mary Kaldor and Javier Solana, has presented a report entitled From Hybrid Peace to Human Security: Rethinking the EU Strategy Towards Conflict together with twelve background research papers . Conflicts are at the sharp end of contemporary crises. Refugees, extremist ideologies, criminality and predation are all produced in conflict. Contemporary conflicts are sometimes known as ‘hybrid wars’ or ‘new wars’ in which classic distinctions between public and private, government/regular and rebel/irregular, and internal and external break down. They are best understood not as legitimate contests of wills (the twentieth century idea of war) but as a degenerate social condition in which armed groups mobilise sectarian and fundamentalist sentiments and construct a predatory economy through which they enrich. Identifying ways to address violent conflict could open up strategies for dealing with broader issues. In this special openDemocracy series, the Human Security Study Group outlines the main conclusions of our report in our introductory essay together with six essays based on some of the background papers. These essays include: an analysis of the conceptual premises of the Global Review (Sabine Selchow); three essays on specific conflict zones – Syria (Rim Turkmani), Ukraine (Tymofiy Mylovanov), the Horn of Africa (Alex de Waal); the importance of the EU’s justice instrument (Iavor Rangelov); and how EU cyber security policy is human rights focused rather than state focussed (Genevieve Schmeder and Emmanuel Darmois). Bosnia ten years after Dayton. 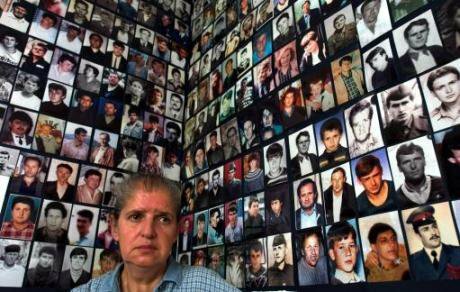 A survivor of the Srebrenica massacre and dozens of photos of missing citizens in the Association of Srebrenica widows, Tuzla. Amel Emric/Press Association. All rights reserved. Few issues galvanise citizen action and activism in conflict-affected areas like justice for atrocity crimes and economic crimes. This high demand for justice reflects the criminalised character of both the violence and the war economy in today’s conflicts. Most people on the ground experience conflict as daily encounters with different forms of abuse and predation that make their lives profoundly insecure. Halting such abuses is the first priority. But while international actors focus on top-down peace negotiations, local civil society groups tend to emphasise holding perpetrators accountable and providing redress to victims. They emphasise justice because they are aware that the spectrum of abuse and criminality – human rights violations, organised crime, corruption – is often at the heart of the conflict and persists even when the hostilities have ended. And they recognise that the problem has to be tackled from both ends: by marginalising the networks that drive and benefit from such abuses, and by addressing the grievances they produce, which otherwise further polarise communities and swell the ranks of extremists. What is remarkable is the extent to which so many of these actors seek engagement with the EU, seeing it as their ally and hoping that its support will make all the difference. In conflict-affected areas where the EU is involved in some way, the EU often becomes the focal point for local advocates of justice and their demands. These ‘justice networks’ take different forms in different places: from protest movements in Ukraine and Bosnia that demand accountability for endemic corruption, to grassroots activists and journalists in Afghanistan and Syria that document and publicise human rights violations, often putting their own lives at risk. What is remarkable is the extent to which so many of these actors seek engagement with the EU, seeing it as their ally and hoping that its support will make all the difference. The RECOM initiative in the Balkans is typical in that respect. It is a regional civil society initiative that advocates the creation of a regional truth commission to establish the facts of war crimes committed on the territory of the former Yugoslavia between 1991 and 2001 and to resolve the problem of the remaining thousands of persons that are still missing. The Coalition for RECOM has conducted extensive consultations at local, national, and regional levels with victims and veterans associations, NGOs and religious communities, women’s and youth groups, artists, journalists and other groups in civil society. These consultations brought into a conversation many people whose politics are often seen as irreconcilable, like victims groups from different ethnic communities. They resulted in a draft statute of the commission and more than 500,000 signatures of citizens who support the initiative. The Coalition has even collected some of the documentation on which the commission can build. The future of RECOM, however, now depends on the EU. It hinges on whether the EU takes the lead in facilitating the next stage of the process: the inter-governmental negotiations that are necessary for establishing the commission. These consultations brought into a conversation many people whose politics are often seen as irreconcilable, like victims groups from different ethnic communities. RECOM is just one example of the ways in which EU is called upon to engage in local struggles for justice. It suggests a distinctive role for the EU in today’s conflicts: strengthening the justice networks and weakening the conflict networks. The Human Security Study Group has identified the need to marginalise the conflict networks as a critical issue because these actors are adept at subverting EU policies for ending conflict and building peace, or hijacking them for their own political and economic gain at the expense of ordinary citizens. The EU has instruments at its disposal to respond to local demands for addressing pervasive abuse and criminality. In doing so, the EU can also build an alternative source of legitimate political authority and a constituency for genuine reform. Can the EU deliver? Our study commissioned for the Strategic Review identified two main challenges. One of them has to do with EU justice policies and the other with the experience of the member states that shapes these policies. A major problem is that for the EU, justice tends to be only a question of principle. It is about commitment to ethics and norms in foreign policy. When the EU’s normative commitments are seen to clash with strategic considerations for peace and stability, justice is often compromised and deferred. For instance, the EU often considers justice and peace to be competing goals in peace processes. Cutting deals with perpetrators is seen as a pragmatic strategy for ending the violence. But when narrowly negotiated deals are used to entrench the conflict networks in power structures - instead of enabling their marginalisation over time, peace agreements end up foreclosing space for reform or paving the way for renewed violence. These were some of the unintended consequences of the Dayton agreement in Bosnia and Bonn in Afghanistan. This combination of amnesty and amnesia cannot provide a blueprint for dealing with today’s conflicts. And its dark underside is increasingly revealed in Europe itself. The other reason why justice is marginalised in EU foreign policy has to do with the experience of the member states. With the partial exception of the Holocaust, European states have done little reckoning with their own legacies of abuse and injustice inherited from war and repressive rule in Europe and the former colonies. The negotiated transitions from dictatorship to democracy in Southern and Eastern Europe involved either very limited justice or none, as in Spain’s ‘pact of silence’. In large parts of Eastern Europe, this enabled former elites to convert their political power into economic power and paved the way for plunder and criminalisation after the revolutions of 1989. Likewise, decolonisation was not accompanied by acknowledgement and redress even for the most egregious abuses of the colonial period, such as the French atrocities in Algeria. This combination of amnesty and amnesia cannot provide a blueprint for dealing with today’s conflicts. And its dark underside is increasingly revealed in Europe itself, where unaddressed legacies of past abuse and injustice are one factor in the rise of neo-fascist, racist, xenophobic and other extreme movements and parties on the far right. A creeping ‘authoritarian nostalgia’ in some parts of Europe also feeds off historical revisionism, challenging the democratic order and the European project itself. Our research suggests that the EU needs to prioritise justice both internally and externally, encouraging the member states to deal with their own past and creating space for justice networks and initiatives inside and outside Europe. A similarly calibrated approach is needed to address economic criminality, much of which is transnational in character. Conflicts generate huge profits from illegal arms sales, drugs, smuggling, embezzlement and corruption, contributing to the global illicit financial flows estimated at more than USD 1 trillion a year. Money laundering of criminal proceeds exacerbates inequality both at their origin and destination. It fuels the monetization of politics by creating incentives for political leaders to connect to criminal networks. And it affects European citizens directly, for instance by turning finance and real estate in places like London and Paris into major drivers of inequality. In fact, violent conflict could be seen as a sort of mechanism for predatory global redistribution of power and resources. Justice is critical for disrupting this mechanism and redressing some of its pernicious consequences.